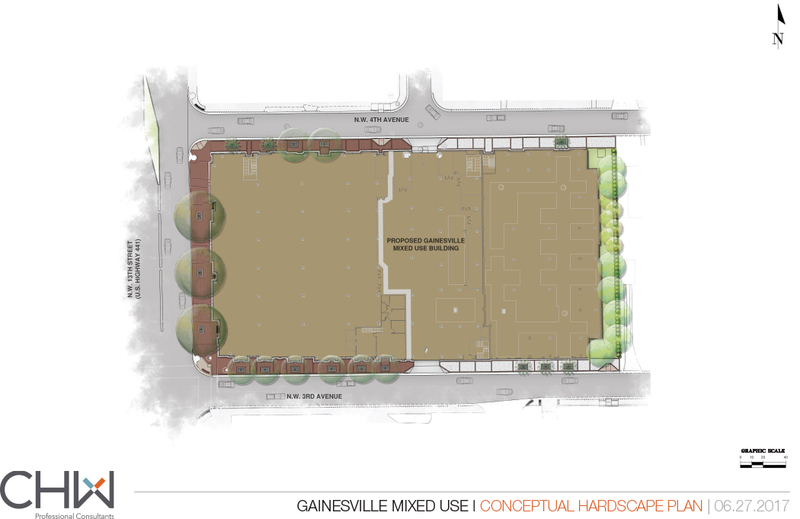 CHW congratulates RD Management on the approval of their Gainesville Mixed Use project, located in the 300 block of NW 13th Street in the heart of Gainesville. The project is a stellar example of positive urban infill redevelopment. The seven (7) story mixed-use building replaces a former car wash and vacant retail along the central US 441 / NW 13th Street Corridor. The investment in our community is key to both commercial and residential revitalization by delivering ground-floor retail and service businesses to the University Heights and College Park Neighborhoods. This project plays a key role in defining the NW 13th Street / University Avenue gateway onto the University of Florida campus. Located just three (3) blocks north of U.F. and six (6) blocks west of Santa Fe College’s Downtown Center, the residential units will provide attractive housing proximate to both higher education institutions, numerous offices, and countless other local businesses. The mixed-use project also delivers the urban density necessary to support mass transit, while perfectly located to encourage walking and biking to nearby education centers, employment, shopping, restaurants, and local cultural attractions. The redesigned site will be defined by the introduction of new urban areas with sidewalks, a transit stop, and streetscaping along all the building’s street-side faces, lining NW 13th Street and both NW 3rd and 4th Avenues, connecting the redevelopment to the adjacent neighborhoods. Urban Design, Civil Engineering, Land Planning, Landscape Architecture, Geotechnical, Photometric, and site construction services have and will continue to be provided by local professional firms, which strengthens our core communities economy. We all applaud RD Management on their newest project and their investment in our community, which delivers opportunities today and for many future generations of Gators!